Book hotel rooms online with us at Hotel Alba at the lowest rate, guaranteed. 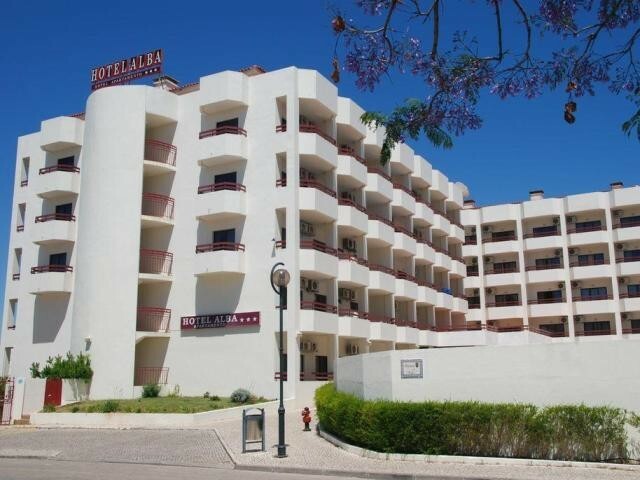 Get a holiday discount room rate at the 3 Star Apartment Hotel Alba located in the coastal holiday area of Monte Gordo in the eastern Algarve. The 103 holiday self-catering apartments are only 400 metres from the beach and within easy walking distance for families. The Monte Gordo long sandy beach is a favourite for family holidays as it is not normally subject to ocean currents and safer sea bathing for smaller children. The units of Apartment Hotel Alba in the Algarve are divided between studios and one-bedroom both sleeping from two to four persons. Each air-conditioned apartment has a kitchenette, satellite TV a safe, en-suite bathroom and a spacious balcony. There is an outdoor pool for adults and a separate pool for children. Restaurant and Bar facilities are available including private parking areas. The Monte Gordo Casino is only 500 metres from Hotel Alba, and there are several excellent 18-hole golf courses within reasonable driving distance. A trip into neighbouring Spain takes less than half an hour.